My son and I decided to give The Valley a swerve this afternoon, well I did anyway, and instead we made the short journey to Priory Lane instead to watch Eastbourne Borough's last friendly at home to Bromley, a side that an Addicks XI played a few weeks back. They won with a last minute goal from stalwart Darren Baker after looking unlikely to break down an impressive Bromley defence all afternoon. In fact as the Borough contemplate life in the highest non-league level for the first time, I have a feeling they may struggle against better and mostly professional teams such as their first three opponents Rushden & Diamonds, Stevenage and Oxford Utd. Bromley were quicker and more inventive in the first half but following a number of changes both Jay Lovett and the well travelled Frenchman Jean-Michel Sigere helped improve things in the second period. 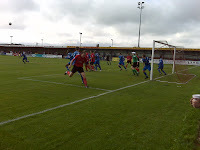 However late on Bromley forced a fine save from Winterton and hit the bar before Baker gave the home fans encouragement for the new season just before the final whistle slotting home from a corner.